Tell CNN now: Stop downplaying Palestinian suffering! Tell CNN: Stop ignoring Palestinian suffering in its coverage of the conflict! Share the action on Twitter! Share the action on Facebook! As the world watches the Israeli assault on Gaza, mainstream American media has been presenting a one-sided picture of the conflict. Tell CNN now: Stop downplaying Palestinian suffering in your coverage of the conflict! CNN’s Chris Cuomo said the “death toll in Israel is rising as rockets keep coming in from Gaza,” when there have been 200 Palestinian deaths and only one in Israel. CNN’s Fredricka Whitfield suggested that Gaza missiles may be more powerful than Israeli missiles, when Israel’s sophisticated military technology is no match for Gaza’s crude rockets. The narrative is so skewed that commentators have even gone so far as to claim that scenes of destruction in Gaza are in Israel (Diane Sawyer, ABC), and to call the Israeli military “incredibly compassionate” (Ben Ferguson, CNN) for warning Palestinians before bombing their homes. The Israeli government has also warned tens of thousands of Palestinians in northern Gaza to evacuate their homes. As The Daily Show’s Jon Stewart said, Gaza is between Israel and the sea. Where exactly are they supposed to evacuate to? The border of Egypt is closed, locking the Gaza residents into an open-air prison. We deplore the targeting of civilians by the Israeli military and Hamas. While Israeli civilians have warning sirens, bomb shelters, the Iron Dome, and one of the best equipped militaries in the world, the people of Gaza have no sirens, no shelters, no place to run, and no place to hide. The U.S. media’s portrayal of Israel as the victim misleads the American public into supporting continued unconditional military aid to Israel to the tune of $3.1 billion a year. 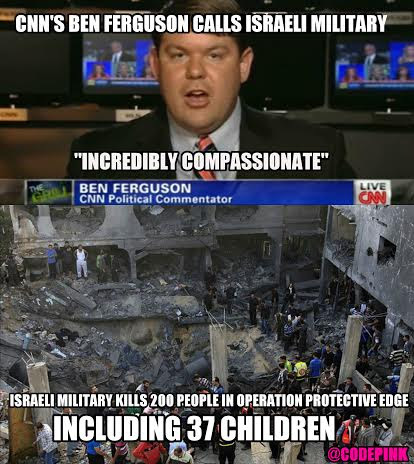 CNN’s coverage unfairly blames the people of Gaza for the violence wrought upon them. They rarely mention Israel’s crushing military offensive that has killed almost 200 Palestinians and destroyed schools, hospitals, centers for disabled people, and much more. They rarely give the larger context showing how Gaza has been under siege, unable to control its own borders, airspace or coastline. Even now with the coverage of the ceasefire, there’s no mention of the fact that Israel violated the last two negotiated ceasefires, or that the conditions of the ceasefire were negotiated between Israel and Egypt and the US–– without Hamas. When Diane Sawyer misidentified images of Palestinians in the aftermath of an Israeli airstrike on ABC World News, saying they were Israelis under fire, she immediately came under heavy criticism by activists and was forced to make an on-air apology for her error. Let’s keep the pressure up on the media provide more accurate coverage- sign this petition to CNN now! 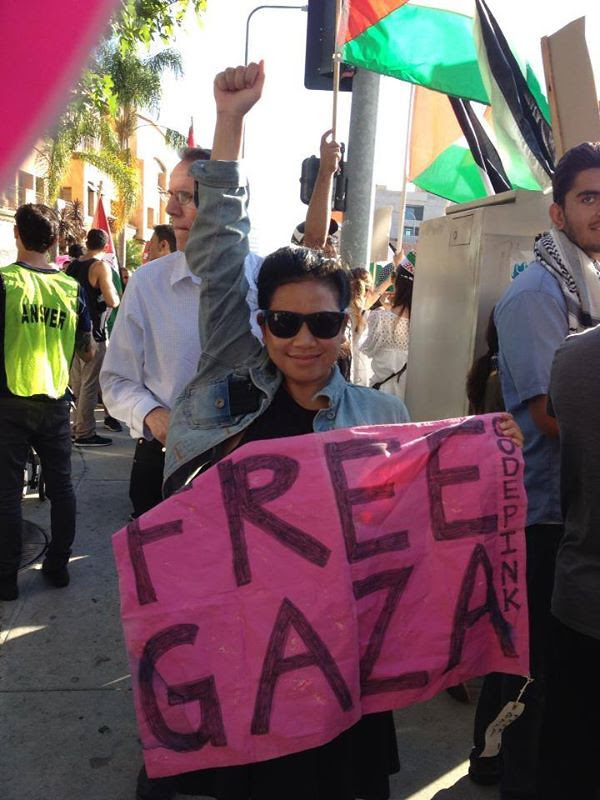 PS: Find resources to take more action at www.endtheoccupation.org/gazaunderattack.